Japan was shut off from the western world from the 17th to the 19th century, but then rapidly industrialised. These magnificent gold 100,000 yen coins were issued to celebrate the 60th anniversary of Hirohito's reign, and the enthronement of Emperor Akihito. 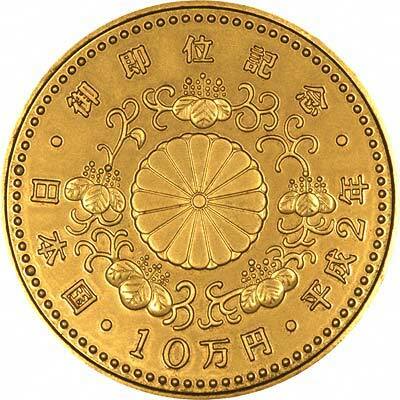 The nominal or face value of many of Japan's gold coins is high relative to its gold content. At the time of writing, for example, 100,000 Yen was worth about £650 and the 100,00 Yen Hirohito's gold content was worth about £365. 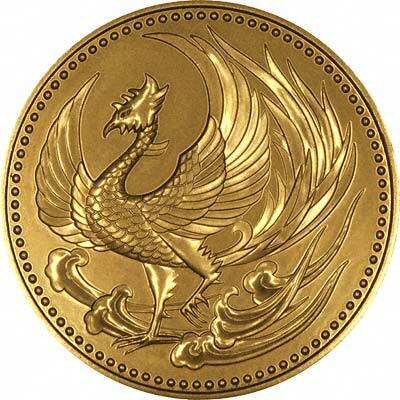 In 1990, the Japanese Government wrongly accused a British dealer of dealing in large quantities of counterfeit Japanese gold coins. the case was still rumbling on in 1992. For silver and base metal coins of Japan, please look at our original Chard Coins website.